This website is owned by Mademoiselle de Margaux, a simplified joint-stock company (SAS) incorporated in France with share capital of €1,590,390, registered with the Trades and Companies Register of Bordeaux under number 444 784 037 00020, having its registered office at 1 Route de l’Ile Vincent, 33460, Margaux, France, intracommunity VAT number FR 44 444 784 037. The Publication Director for this website is Mr Bernard Fournié, acting in his capacity as Manager. The website is hosted by GSI Network, a simplified joint-stock company (SAS) registered with the Trades and Companies Register of Bordeaux under number 818 903 726, having its registered office at 104 cours du Médoc 33300 Bordeaux, France. This website was developed by Atypicom, located at 2 Impasse des Mûriers, 33700, Mérignac, France – Tel. : +33 (0)5 56 12 05 99.
via the contact form on this website. The user of the www.mademoiselledemargaux.com website hereby duly declares that he/she has the necessary capabilities and resources to access and use this site. The user also hereby declares that he/she has checked that the computer configuration used does not contain any viruses and that it is in perfect working order. Finally, the user also hereby declares that he/she has read this Legal Notice and undertakes to comply with the terms and conditions herein. Pursuant to the French Data Protection Act of 6 January 1978, amended, a formal declaration has been submitted to the French Data Protection Authority (www.cnil.fr), under reference number 0630285, in relation to the processing of personal data via the www.mademoiselledemargaux.com website. Pursuant to article 32 of the French Data Protection Act of 6 January 1978, amended, the user is hereby informed that Mademoiselle de Margaux, as the data controller, processes personal data for the primary purpose of managing the user’s registration to the community website and for the sending of newsletters. All fields indicated by an asterisk are required. Where you fail to reply or where you provide incorrect information, Mademoiselle de Margaux may be unable to process your request. The user is hereby informed that he/she has the right to access, question, supplement, update, block or remove his/her personal data, where such data are inaccurate, incomplete, ambiguous or outdated, or where the collection, use, communication or retention of such data is prohibited (article 38 et seq. of the French Data Protection Act). The user also has the right to object to the processing of his/her data for lawful reasons, and to object to the use of such data for commercial prospecting purposes. The user is hereby informed that a cookie may be installed automatically on his/her browser when visiting this website. A cookie is a small file which cannot be used to identify the user personally, but which is used to store information relating to a computer’s browsing activity on a website. The data gathered via this cookie are used to adapt the website to visitor demands, improve the browsing experience on the website for future users, and measure traffic statistics. Depending on the configuration of your browser, you may be notified when an attempt to install cookies is made, or you may block the installation of cookies, using the procedure described at the following address: www.cnil.fr. However, where you block the installation of cookies, you may have difficulty accessing, or be unable to access, certain services. The data collected are retained for a maximum period of 13 months. Beyond this deadline, you will be required to renew your consent for the installation of cookies. This website https://www.mademoiselledemargaux.com is the exclusive property of Mademoiselle de Margaux and is subject to French and International copyright and intellectual property laws. Any reproduction, whether in whole or in part, of this website (including text, design, photos or other iconographic resources that remain the property of the author) by any means whatsoever, without the express permission of Mademoiselle de Margaux is prohibited. Any such unauthorised reproduction or representation shall constitute an offence, and shall be subject to the sanctions set out in articles L.335-2 et seq. of the French Intellectual Property Code. Les boîtes de chocolat Mademoiselle de Margaux sont faites à partir de carton recyclable. Mademoiselle de Margaux chocolate boxes are made from recyclable cardboard. 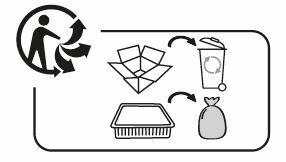 To find out how to sort your packaging and how to recycle it, visit the website www.quefairedemesdechets.fr.